The first thing you’d see in Bare Conductive’s booth at Maker Faire Bay Area is a paintable wire. It’s a water solvable, nontoxic conductor that’s sold for soft circuit projects. However, closer inspection reveals painted patterns on the booth tables leading to lights, a laptop and an iPad through an Arduino-like board. Approaching or touching the painted surface triggers unanticipated behaviors and the magic behind this is capacitance. Touching some paint triggers a binary state. The light bulb turns on or off and the iPad piano key is depressed. Approaching some paint gradually increases levels. The laptop displayed a red bar that varied in size with proximity. All these were different programmed responses to change in capacitance and it was all defined in a special version of Arduino called the Touch Board. The Touch Board is customized to make it easy to manage change in capacitive input. It’s based on Arduino Leonardo and has an extra set of special features. It has a capacitance chip which connects to 12 tabs down one side of the board for input and which communicate to the Arduino via two analog pins. The card has an MP3 chip for playing content stored on an SD card and also a MIDI interface with 200 instruments. In addition it has an audio out jack and a battery charger. While it has all these features it remains Arduino compatible and accepts standard shields. The idea of making capacitive input easy to manage and adding the option of mixing in MP3 and MIDI instruments offers all sorts of possibilities. The compatibility with Arduino Leonardo ensures access to Arduino code and the vast array of shields. 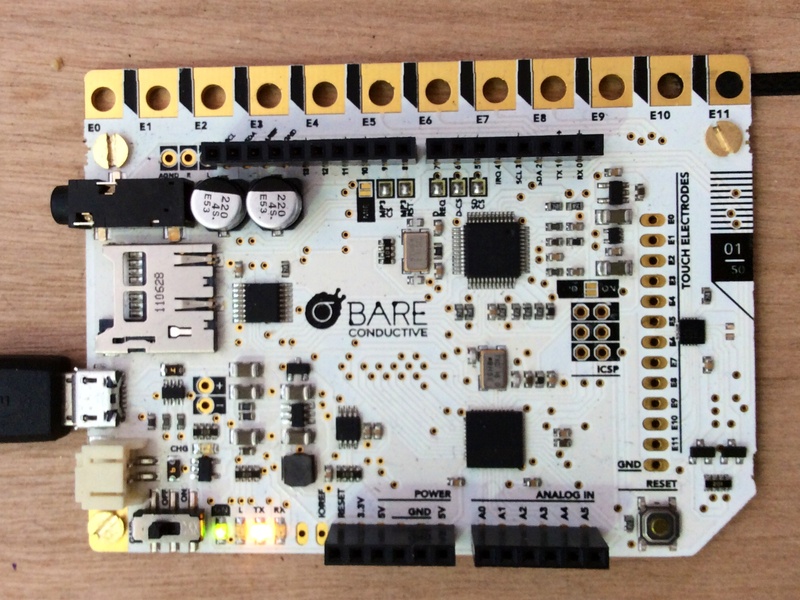 Though the Kickstarter campaign will be the first to be fulfilled in June, Bare Conductive is taking preorders for the next batch at www.bareconductive.com/shop. If you use coupon code “light” at checkout you’ll receive a 15% discount off the £55 price.